Ford of Britain said 2015 will be one of the busiest years for new product in the company’s history. Ford confirmed for the first time that an all-new Ford Galaxy seven-passenger vehicle will go on sale about mid-year. Other new models coming in 2015 include the all-new S-MAX, C‑MAX, Grand C-MAX and Mustang. The all-new Edge SUV will go into production in late 2015. In addition, Ford will complete the rollout of the all-new Mondeo with variants equipped with Intelligent all-wheel drive, high-powered diesel and petrol engines, and the award-winning 1.0-litre EcoBoost. The new Focus family is also being expanded to include a new Focus ST and Focus diesel ST, followed by refreshed versions of EcoSport and Ranger. This year Ford expects to launch new or significantly refreshed versions of passenger cars that last year accounted for around 45 per cent of total sales. Ford will debut its upscale Vignale product and ownership experience in 2015 with the Vignale Mondeo. Vignale will be sold from select FordStores across the UK. Among bespoke services available to customers who have bought a new Ford Vignale from the FordStores will be collection and delivery for vehicle servicing – from a home address or office location – alongside servicing scheduled to suit the owner. Vignale customers will be able to make all arrangements, and make any Vignale-related enquiries via a single, free telephone number. Vignale vehicles will always be handled with care and, with a premium valet, handed back to owners waxed, cleaned, and vacuumed. Ford’s expansion of its SUV range was led by the introduction of the new Kuga, first revealed in late 2012. Last year, the company introduced the all-new EcoSport compact SUV, combining the practicality and affordability of a small car in a spacious, flexible SUV package. This year Ford will start production of the all-new Edge, Ford’s most advanced SUV, which will go on sale to European customers for the first time. The company also will introduce enhancements for EcoSport for a fresh, comprehensive range of small, medium and large SUVs. A mouth-watering year for performance vehicle enthusiasts includes the arrival of an icon. 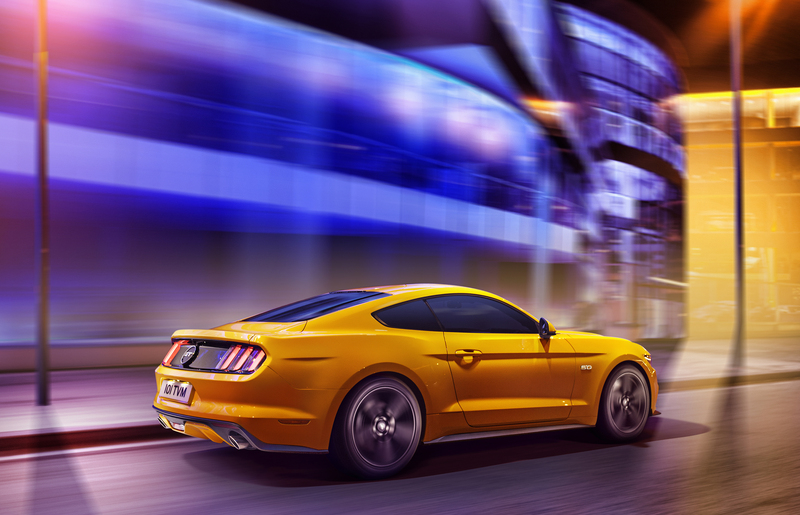 After more than 50 years, the all-new Ford Mustang will go on sale in the UK for the first time and Fastback and convertible models will be offered equipped with Ford’s new 2.3-litre EcoBoost engine, and the latest generation of Ford’s legendary 5.0-litre V8. In early 2015, Ford will introduce the new Focus ST. Offered as a five-door model, and estate, the new Focus ST will for the first time offer a powerful diesel option – the most fuel‑efficient and lowest CO2 Ford performance car ever. Only last month, Ford confirmed it will be launching an all-new Focus RS. The 30thRS model produced by Ford since 1967 will be the first to go on sale globally, and is among more than 12 new performance vehicles that Ford is bringing to customers worldwide through 2020. The all-new Ford Galaxy that will join Ford’s family vehicle line-up this year, is the fifth generation of one of Europe’s most popular seven-seat family movers. For families, Ford will deliver a wide spectrum of new models including, in spring, an all-new version of the trail-blazing S-MAX sports activity vehicle. At the same time, the stylish new C‑MAX and Grand C‑MAX multi-activity vehicles will enhance a MAX family that also includes the B-MAX multi-activity vehicle to ensure the broadest choice of family vehicles in Europe. Ford will extend the all-new Mondeo range which includes, for the first time, the Mondeo Hybrid Electric Vehicle. There also will be a first Mondeo 1.0-litre EcoBoost, equipped with the engine that achieved an unprecedented third consecutive victory when it was named 2014 International Engine of the Year. Ford will introduce to the line-up Intelligent all-wheel drive, and a new twin-sequential turbocharged 210PS 2.0-litre TDCi diesel engine. All-new S-MAX will debut in Europe Ford Adaptive Steering, which continually changes the ratio between the steering and road wheels according to vehicle speed. It also will introduce Front Split View Camera technology to the segment, which makes negotiating junctions or parking spaces with restricted visibility easier through the use of a 180deg camera system installed at the front of the vehicle. Finally, all of the vehicles being launched in 2015 will feature SYNC 2 – Ford’s connectivity system with advanced voice control and eight-inch colour touchscreen. This enables drivers to operate phone, entertainment, climate and navigation systems using simple conversational language. Drivers can even bring up a list of local restaurants by using the command: “I’m hungry“. This entry was posted in Car Updates & Releases, Luxury Cars, Manufacturer News, New Cars, Performance Car, Popular Cars and tagged ford, Ford C-Max, ford ecoboost engine, Ford Edge, Ford Galaxy, ford grand c-max, ford mondeo, Ford Mustang, Ford S-Max, ford vignale, lease a new ford by David Petherick. Bookmark the permalink.